When most people think about different books they’ve read, they tend to associate the author with one of “The Big Five” publishing companies. These traditional publishing powerhouses in the United States are HarperCollins, Simon & Schuster, Penguin Random House, Hachette Book Group, and Macmillan Publishers. Although these companies have a huge distribution and impact in the literary world, it is actually self-published indie authors that are taking over the book market. The rise of e-readers such as Kindles, Nooks, and iPads has attributed to the rise of these self-published authors. 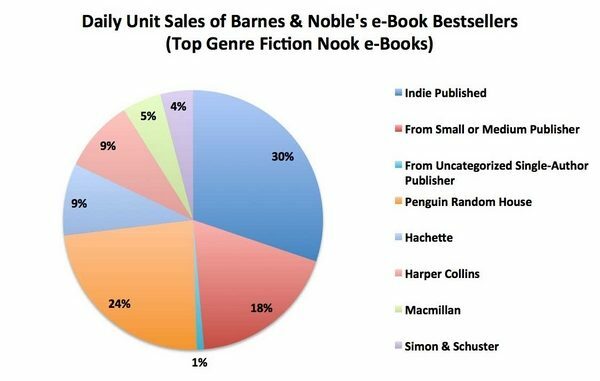 Indie authors tend to focus more on e-book sales than paperback because of the decline of hardcopy books in the market. This decline has caused rocky sales results with the traditional companies, since their focus is primarily mass market paperbacks and hardcovers. For this reason, indie authors have topped the best-seller lists like Amazon’s Top 100, USA Today, as well as the New York Times, replacing traditional authors. Back in February, The New York Times responded by announcing big changes to their best-sellers list, which would cut a huge range of categories that heavily impact indie authors. This change guarantees that indie authors will not rank on their best-sellers list, giving the spots they earned due to e-book sales back to traditional authors signed with the powerhouse companies. Indie authors won’t get the proper recognition that comes with the rising popularity of their books now that the Times has chosen to take away the online list. Since the announcement was made, there have been many posts online from outraged writers and readers. Many female authors focus on the romantic genre and have been featured on the romance category of the best-sellers list. Now, they won’t be recognized unless paperback sales increase. So the 10,000 authors represented by RWA, as well as the hundreds of thousands of other self-published authors, will need to find other ways to seek recognition in sales. When self-publishing started growing in popularity, many people were still skeptical of the successful results. After all, self-publishing means that the author has total control of not only the content, but the edits, cover design, and marketing. This means that it’s up to them to hire professional editors and designers. Not to mention that without a large company like HarperCollins behind you, it is assumed that you won’t succeed in the publishing world because you don’t have the reach of readers that traditional authors have. However, self-publishing has become a respected path to take in the literary world within the last few years, with indie authors still dominating Amazon’s best-sellers lists. The professionalism that has grown with indie authors is allowing the skeptics to see that indie authors are fierce competition against traditional authors. For instance, Skye Knizley’s “Storm Chronicles” series has been on Amazon’s Top 100 best-sellers list for horror since the first book was released back in 2013. Rue Volley’s book “13 Ways to Midnight” has also done exceptionally well on Amazon since its release earlier this spring. The success Colleen Hoover has experienced since her start in 2011, is the perfect example of indie authors being on the rise. Her novel “Confess” is currently being made into a television show starring Katie Leclerc and her book “Ugly Love” is being adapted into a movie starring Nick Bateman. Even my book, “A Safe Place to Fall,” has made Amazon’s best-sellers list, hitting the Top 100. My second book, “A Hard Place to Breathe,” is quickly rising in the ranks as well. Even though Amazon is still the best place for indies to rank in sales, its popular feature Kindle Unlimited (KU), where readers can pay monthly fees to “borrow” books from the KU library, has followed suit to change the way their sales count. Recent changes make it so sales rankings are calculated based on when readers actually read the content versus when they download it. This means that indie authors are getting cut from popular platforms’ best-sellers lists in yet another way in order to appease traditional authors from being cut from the lists, as indie authors tend to out-sell traditional authors. This isn’t to say that traditional authors should be downgraded to make room for indie authors in the market. I personally think that there should be more equality between indie and mainstream authors, meaning, one should not be acknowledged more than the other. If the Times and Amazon continues to push aside indie authors to make room for traditional ones, their followers are going to decline because of the growing support for self-published writers.